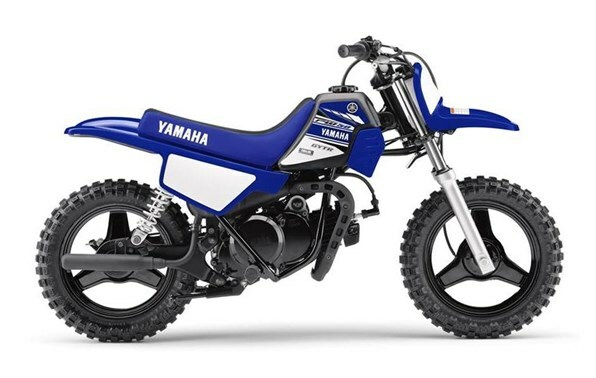 Click the button below to add the 2017 Yamaha PW50 to your wish list. New, Larger Fork: A new, larger 26mm fork improves durability and suspension performance, while stylish new black wheels give the PW50 a racier appearance. Entry-Level Two-Stroke Motor: 49cc air-cooled, case-reed–inducted, two-stroke single is tuned to deliver predictable power that gently eases the new rider up the offroad learning curve. Upgrade Front Suspension: A new, larger 26mm telescopic front fork with 2.4 inches of travel smooths out the bumps for responsive handling with improved durability. L x W x H: 49.0 in. x 24 in. x 27.8 in.